Past and present Unilever bosses have said the firm would be "negatively impacted" by Brexit. Economic uncertainty in the event of a UK vote to leave the EU would hit the consumer goods giant, a spokesman said. 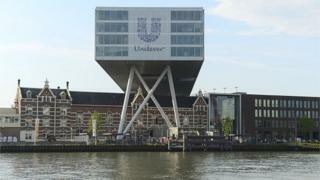 He said Unilever was responding to questions about the future from employees and pensioners. Some UK bosses have previously said that Britain can be economically successful outside the European Union. Unilever said in a statement it would still operate and have facilities such as research laboratories in the UK after a Brexit. But it added: "However, the way we run the company may be fundamentally different if the decision were taken to leave the EU." A spokesman said it was too early to say what effect Brexit would have on Unilever jobs, hiring, or investment. However, uncertainty about the knock-on effects on the UK economy could stifle business behaviour, the spokesman said. "We cannot predict the consequences on the economy and subsequent impact on our operations in the UK," the Unilever statement said. Chief executive Paul Polman, along with former chief executives Patrick Cescau and Niall FitzGerald and former chairman Sir Michael Perry, sent a joint letter to employees on Thursday. "It is not for us to suggest how people might vote... but in taking this hugely important and irreversible decision, we feel a responsibility to point out that Unilever in the UK, with its thriving operating company, international research centres, factories and global headquarters would, in our considered opinion, be negatively impacted if the UK were to leave the European Union." Previously, Mr Polman had told the Guardian that Unilever had no plans to scale back its UK operations in the event of Brexit, but that "it would be very good" for the UK to remain in the EU. In their letter to Unilever's 7,500 UK employees, the bosses said the company owed much of its success over the past 25 years to having access to "a single European market of 500 million consumers". The "collective weight of the European Union" had helped "open up markets and drive standards in other parts of the world, including in such important areas as the environment and social protection", it said. The letter added that the European Union has become "a window on the world - crucial to any European-based business, like Unilever, seeking to grow and prosper in a highly globalised marketplace". But Vote Leave campaigners have previously said that trade in Europe would carry on as before after a Brexit, and that the UK "could do a trade deal with the US that the EU is failing to do". In the UK, some bosses have come out in favour of a Brexit. Last week JCB chairman Lord Bamford wrote to his company's 6,500 employees to explain why he favoured a vote to leave the European Union. He said he was "very confident that we can stand on our own two feet". And Sir James Dyson said Britain would gain more from leaving the EU than it would lose. He said the idea that Britain could not trade successfully outside the EU was "absolute cobblers". Sir James told the Daily Telegraph that the UK "will create more wealth and more jobs by being outside the EU than we will within it".